Here’s the official catalog description for Math 180: “Partial Differential Equations (PDEs) including the heat equation, wave equation, and Laplace’s equation; existence and uniqueness of solutions to PDEs via the maximum principle and energy methods; method of characteristics; Fourier series; Fourier transforms and Green’s functions; Separation of variables; Sturm-Liouville theory and orthogonal expansions; Bessel functions.” It’s really just a list of topics. It’s not even a complete sentence. Ick. This course has historically been one of the more challenging courses. It’s typically taken by juniors and seniors, and beginning graduate students at Claremont Graduate University. All math majors have to take this course, so those who aren’t fond of applied mathematics often don’t have a rosy view of the course. To begin, I’m going to do some backward design (Wiggins and McTighe, 2005). appreciate the wide range of applications of PDEs and be able to describe a specific application of PDEs to colleague. Along the way, students will encounter various solution techniques (separation of variables, method of images, method of characteristics, integral transforms), and mathematical ideas that enable the study of PDEs (function spaces, theory of distributions). The three listed items are my “essential understandings.” The next step in backward design is to think about how students can demonstrate these understandings. For #1, I’m thinking about having students write something mathematical. Perhaps analyze the behavior of a PDE that they had not yet encountered? Or maybe students will need to (re)produce a mathematical argument about the qualitative behavior of some PDE? Goal #2 is the classic bread-and-butter of this subject. PDEs can be a very computational, procedural course, and while I would like the course to be more than that, there is no denying that there are lots of computations and procedures that students will need to master. For #3, I’m thinking of having students do some sort of open-ended investigation on an application area of their choosing. Perhaps this might involve interviewing another scientist/mathematician who uses PDEs in her research or some digging through research articles? I’m wondering about the final product of this part of the course: a presentation or web page or paper? 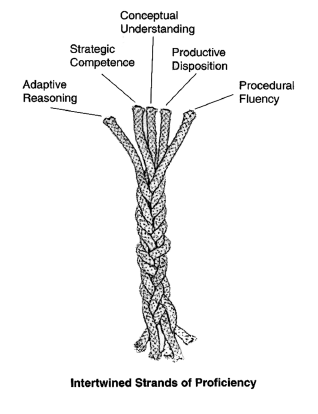 As I’m crafting these learning objectives, I’m also thinking about the strands of mathematical proficiency. Five Strands of Mathematical Proficiency, taken from “Adding It Up: Helping Children Learn Mathematics” edited by J. Kilpatrick, J. Swaford, and B. Findell, published by the National Research Council and National Academy Press in 2001. Procedural Fluency: be able to separate variables and find eigenvalues and eigenfunctions for various differential operators, know how to construct the right orthogonality condition for a Sturm-Liouville problem, write a PDE in conservation form, use the method of characteristics to solve a PDE, etc. For now, I think I have the different strands of mathematical proficiency well-represented in my course objectives. I like how you framed the 3 objectives, Darryl. For the final product, you migh consider allowing the student to decide how to document their work suggesting a presentation, a web page, or a paper. The would allow each a chance to select the medium best suited for what they did and to their own personality, strengths, and preferences. I suspect they would think a presentation is easier to throw together than the other two but if you provide expectations, I think they’ll realize all require comparable time and effort. As a math major who was not required to take a PDE course, I did encounter them in a modeling course where I ended writing a paper on modeling traffic flow through intersections with stop lights and how you time the lights to optimize flow. It was enlightening to understand the “partial” accounts for the lag time if driver n+1 after driver n reacts to the light changing. Even thought of that last night as you graciously navigated LA traffic to get Ben, Nicole and me to LAX. Thanks for that and the great evening. Look forward to seeing how your course progresses. Thanks for the suggestion, Ed! Is there a place for nonlinear first order PDEs? There’s certainly plenty to do without them, but it is perhaps fun/interesting to see a departure from linearity at some point. In the strand called conceptual understanding, what does it mean to understand something? In my instructional design training we were almost prohibited from using the word “understand” because it doesn’t point to a particular way a student can demonstrate that understanding. I guess understand is closer to the one “see” strand (how can students show that they see something) than the three “be able to” strands. I am sure there are many options – I just thought it was interesting that the 5 strands have both explicit and implicit ways that students might provide demonstration/evidence. You’re right about the word “understand”–I was trying to avoid using the word “understand” in my three main course objectives but then I ended up using it later when talking about the five strands. I think in that section maybe the word understand could be a short hand for “having internalized an explanation that one can then reproduce it to another person just starting out learning PDEs”. How is that? Yeah, in a later post (part 4) I included something on nonlinear first-order PDEs.